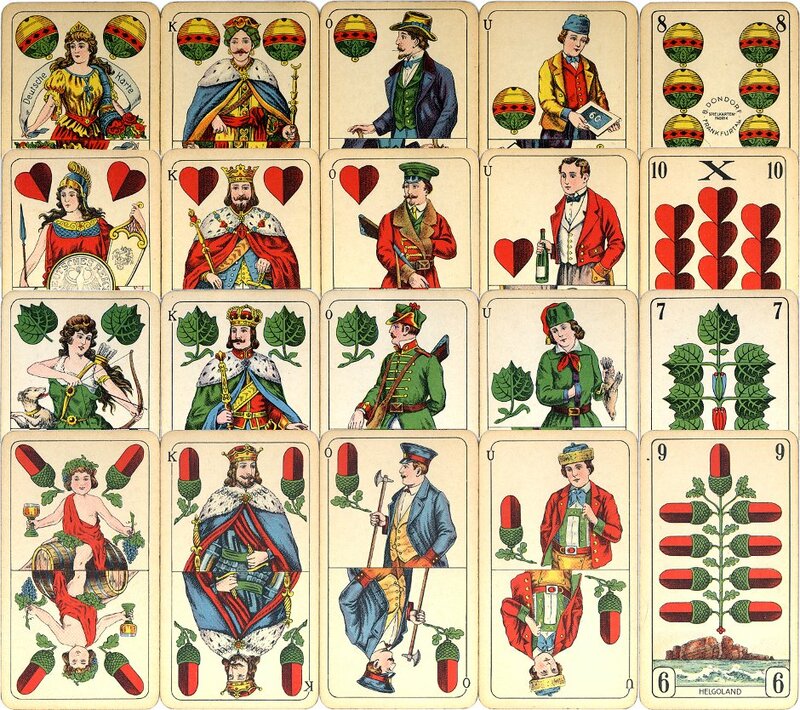 Derived from Jagdkarten or Hunting cards with patriotic overtones, the Prussian pattern coincided with the emergence of politically ambitious Prussia in the middle of the nineteenth century. The figures are largely drawn from the Prussian bourgeoisie with rural scenes as vignettes on the numeral cards. By around 1865 these previously single-figure packs had settled into a standard double-ended version which has had few variations since and embraces a more general theme in its illustration, the lower court cards portraying a more varied set of characters. 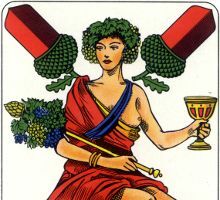 At first the pattern showed a more or less constant set of vignettes on the numeral cards (known as "Genrebildchen") but possibly as a result of the increased facilities for travel, it later entered the souvenir market with the second type depicting views, usually of the surrounding area in which the cards were made. 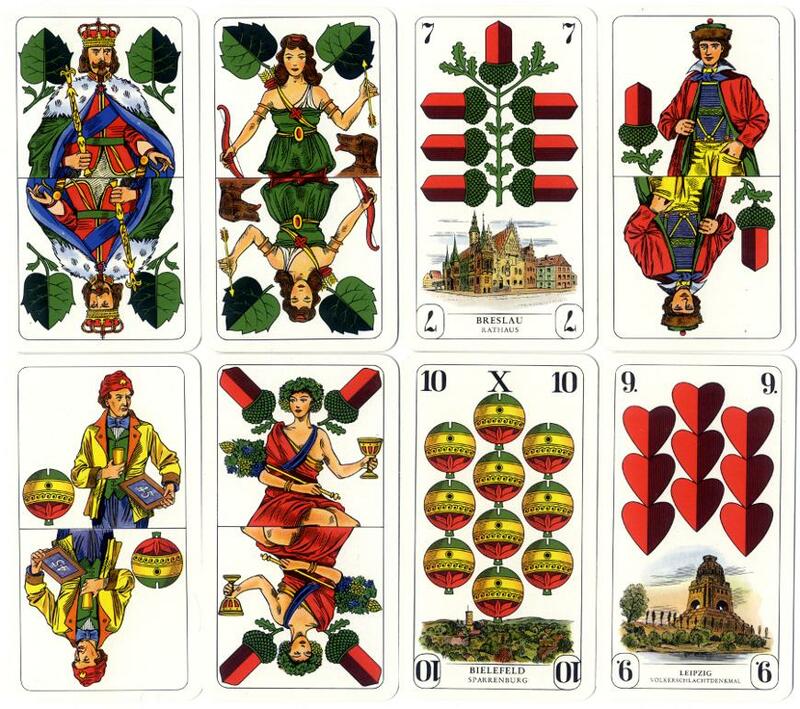 Above: cards from 32-card Prussian pattern deck manufactured by Bielefelder Spielkarten GmbH, 1970. Reverse: black criss-cross. An edition of the Prussian pattern by B. Dondorf c.1930 can be seen here. The pack is still made and used and has also been made in Silesia and Cracow. 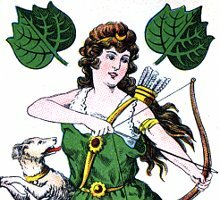 The example shown below is from an antique deck made in Altenburg around 1895. 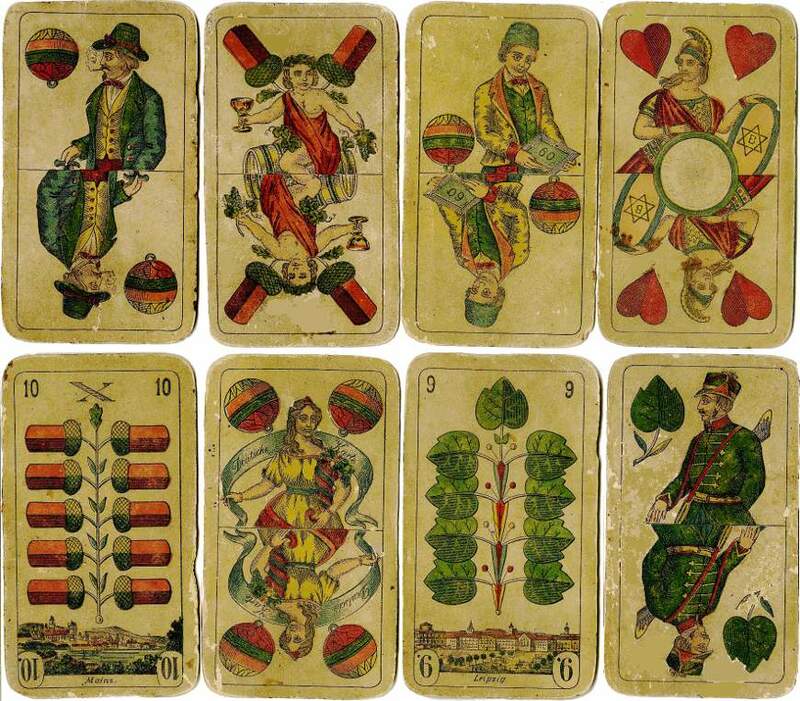 Above: cards from well-used deck made by "Altenburger Spielkartenfabrik Schneider & Co." in Altenburg about 1895 (because of the additional index numbers on the pip cards). Schneider & Co. was the successor of "Altenburger Spielkartenfabrik AG" which was the successor of Gebrüder Bechstein - hence the "B" in the star. Possibly as a result of the increased facilities for travel, the Prussian II pattern emerged with unchanged court figures but with views of cities and landscapes as vignettes on the numeral cards, often reflecting scenes to be found in the area of the maker. Image courtesy Harold Langen.